If you read my Boomerang Effect blog post a few weeks ago you will know that my first attempt to get back home to Bolivia after my Sydney visit was not successful. On the second attempt the boomerang sailed over the Pacific Ocean and all the way across the USA, showing no signs of returning to its place of origin, until… it hit a palm tree in Miami and got hung up there swinging around in circles. I can think of worse place to get stuck for a few days but when you have been away for three months all you want to do is get home! The airport was lively and colorful with large tv screens showing Wimbeldon and the FIFA World Cup. Enthusiastic crowds of all nationalities gathered around. It passed the time. Of course, it would have been a whole lot jollier if the USA hadn’t lost its football match. I tried to be productive, sat down with my laptop, and poured out the entire Table of Contents for my third book. That felt like an enormous hurdle. Then came a list of all the pictures that need to be taken for each chapter. That done, I was all the more eager to get home and get stuck into it. In the end, I bought a ticket on the Bolivian airline BoA (Boliviana de Aviacion) who had recently added Miami to its system and was offering very good fares, free checked bags, and some of the best Economy Class airplane food I have had in ages. 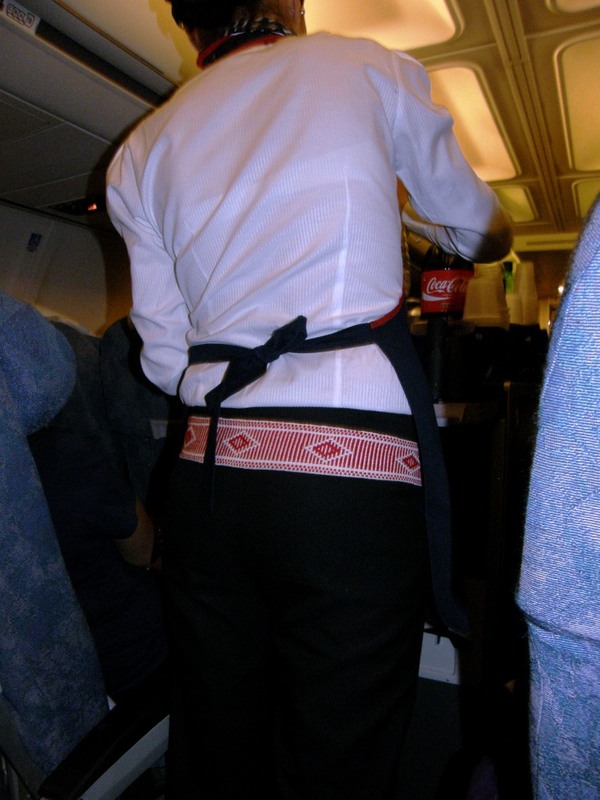 The coolest thing about BoA was the flight attendant uniform. 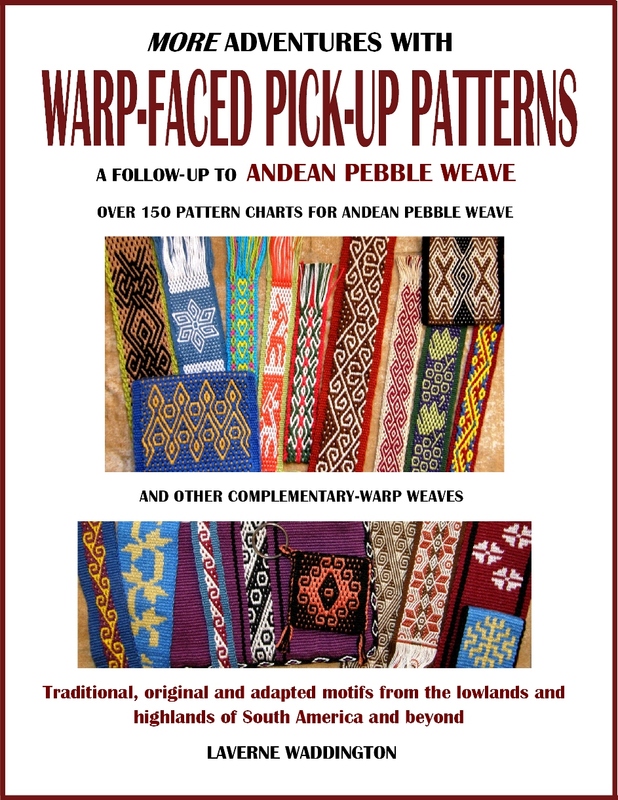 They each had a handwoven warp-faced cotton pick-up patterned band made by weavers from the Bolivian lowlands sewn to their pants…very cool! I had left my brother’s place in Sydney at 9am on Monday and got to my door at 9pm Thursday (Sydney time). It was quite a trip! The jet lag was huge. I have finally reached the point where I can eat lunch without falling asleep in my plate. The BoA uniforms with their woven bands had stirred me into a longing to be home and back at my loom. Now I have finished the main design and am weaving a “‘fringe” of sorts. I divided the fringe into seven sections and am weaving each separately in double weave. I need seven inches of ”fringe” to complete the panel and have just reached halfway. Each section will be a different length with the center one being the longest and the two outer ones the shortest, creating a stepped effect. Years ago, my brother had sent me a picture of a Native American piece in a London museum that had been finished this way and I have been wanting to do that myself ever since. 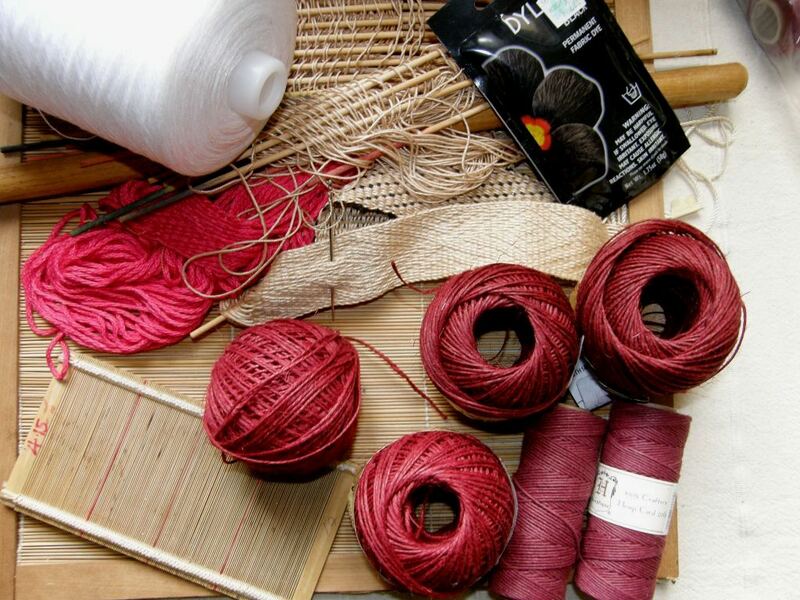 The picture above shows two balls of dark red hemp twine alongside the woven panel. 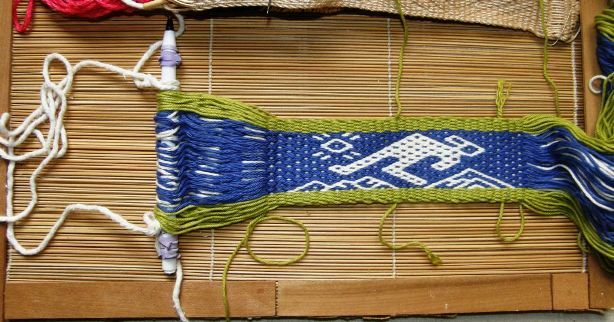 I hope to create two outer panels with this twine using a structure that includes warp-twining that is used by lowland weavers in Peru to make wristlets. The outer panels will be a quiet solid dark red so as not to clash with the crazy busy-ness of the center panel. 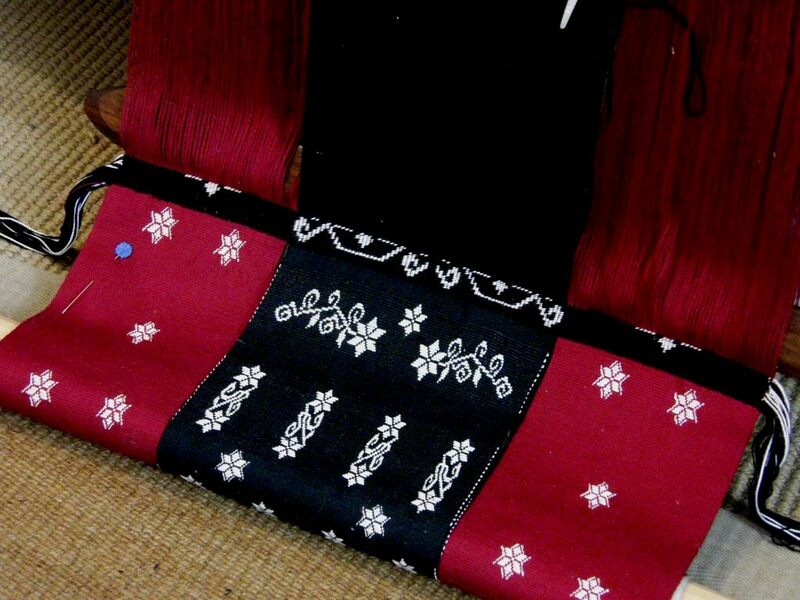 The three panels will then be joined together across the top with weft twining. There is a long way to go before I get to that point. Much sampling with the hemp twine needs to be done first. 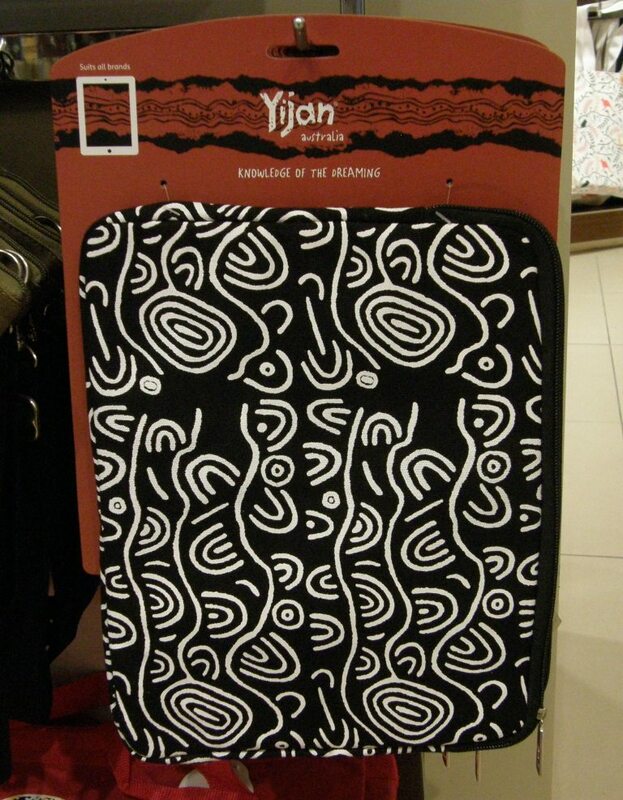 This will be the second piece of three in the second series of red-black-and-white hangings. That’s the first piece above left. Things to come…exciting! 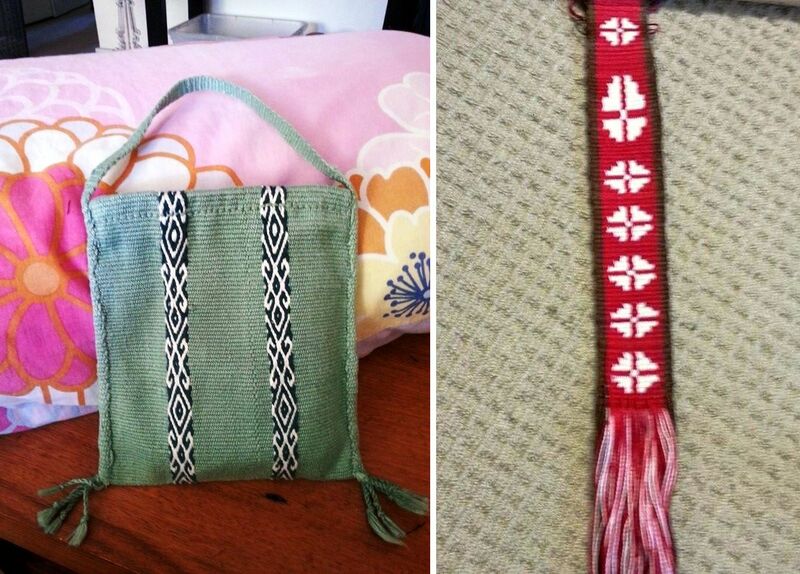 There are a couple of varieties of hemp twine in this picture along with an example of the wristlet structure. You can also see the super fine bamboo reed that I bought at CNCH, now removed from its heavy frame and ready to be used on my backstrap loom. I can’t wait to try it out with some silk. The cone of white thread is the 20/2 perle cotton that I want to use for the third wallhanging…an ikat piece…and there’s some of the black dye that I’ll use for that. I am not sure if I will have time to get that started before I have to leave again but I am happy to have more time in which to ponder that one. I seem to get some of my best ideas while sitting on planes! 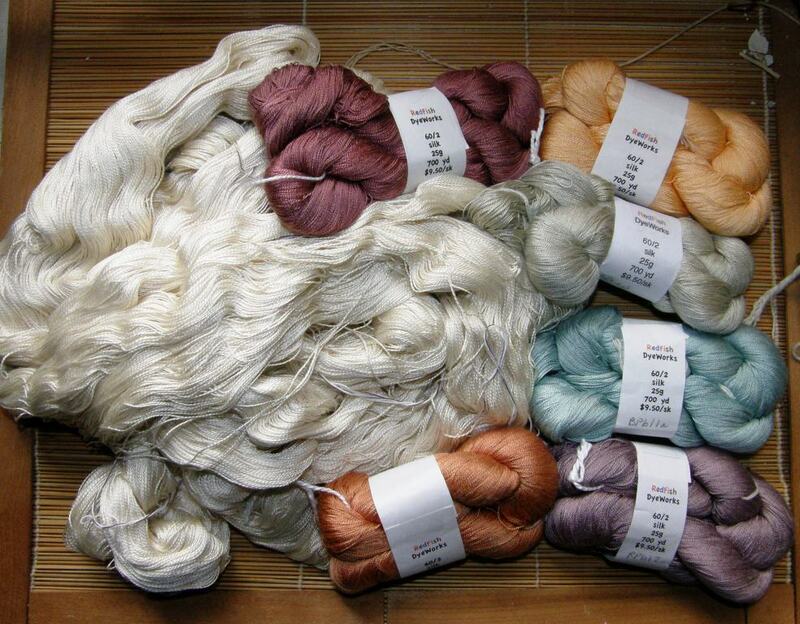 Then there’s the gorgeous 60/2 silk that I got at CNCH waiting to be used as supplementary weft. The large skeins of silk were given to me by my friend Susan in Sydney. It’s a heavier weight silk than the Redfish Dyeworks skeins and I am thinking of using it as the warp for a brocade project. The project ideas go piling up. You can probably tell that I am pretty excited about being home again. 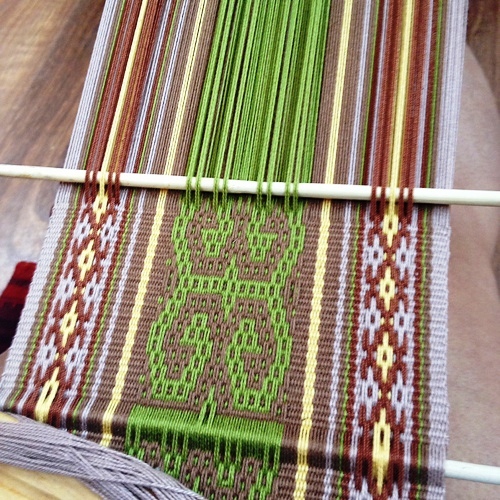 That lovely green warp is now a piece of Andean Pebble Weave patterned fabric ready to be made into a cell phone pouch. That’s my second book that she has opened on the floor. I was showing her how to read the spotted charts. 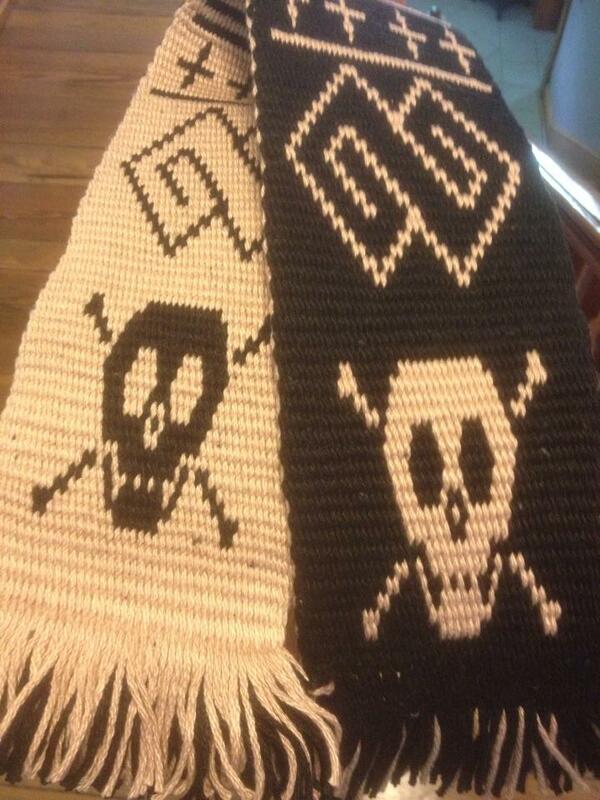 That particular motif also appears in the first book. 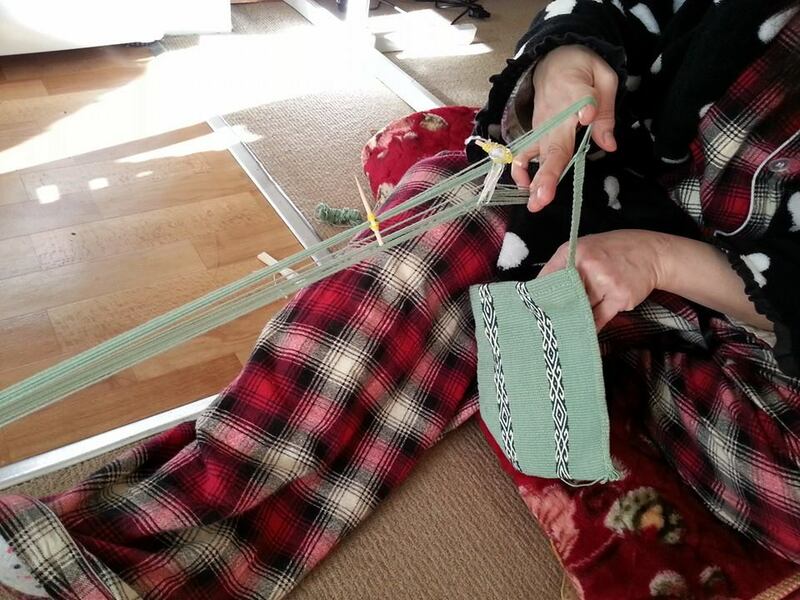 Here she is weaving and sewing a tubular edging to the pouch. There’s the finished pouch along with her intermesh sample band. One of the good things about having to stay longer in Sydney than expected was that I got to visit with the Springwood group of weavers again up in the Blue Mountains at Helen Halpin’s place. What a lively and enthusiastic group of weavers! They meet once a month and there is always a lot of show-and-tell. Yvonne, who had woven with me a couple of weeks earlier, brought in a band that she had since warped and woven. She had played about and created some of her own patterns. I love that! What was also interesting was that she had used bamboo thread. I have never considered using it as I had always thought that it would be too soft. Yvonne’s band felt lovely. 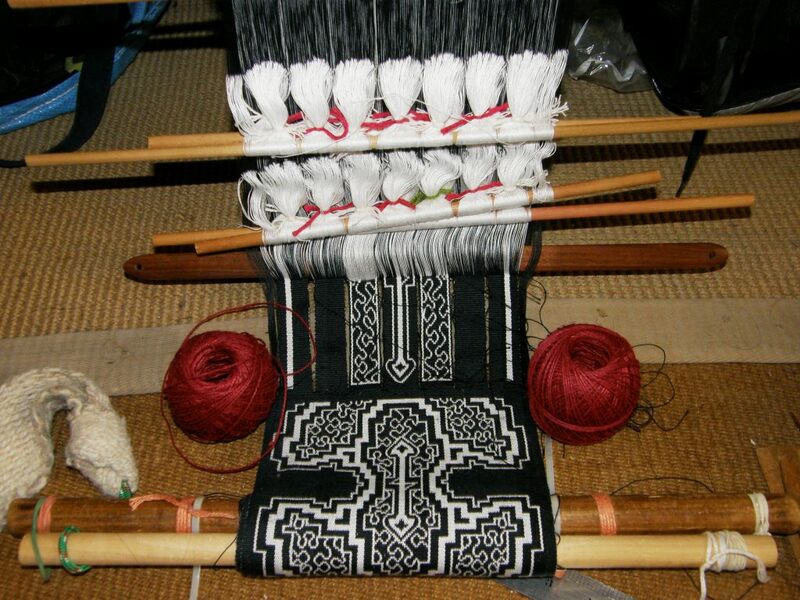 In the Ravelry group, Kim has been progressing with the two-color simple warp-float technique while copying as well as adapting motifs from Central Asian textiles. This piece is beautifully woven and I love the combination of colors. I am surprised at how well that green stands out from that background color….inspiration to be more adventurous with color choices. 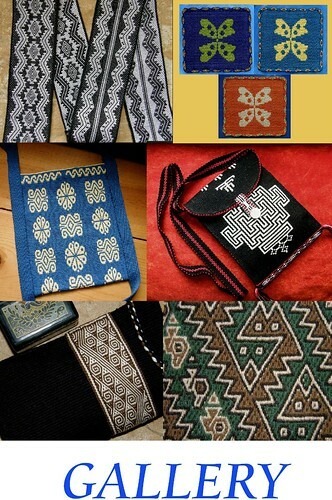 Keith has formed a South American band weaving study group at the Weavers’ Guild of Minnesota. 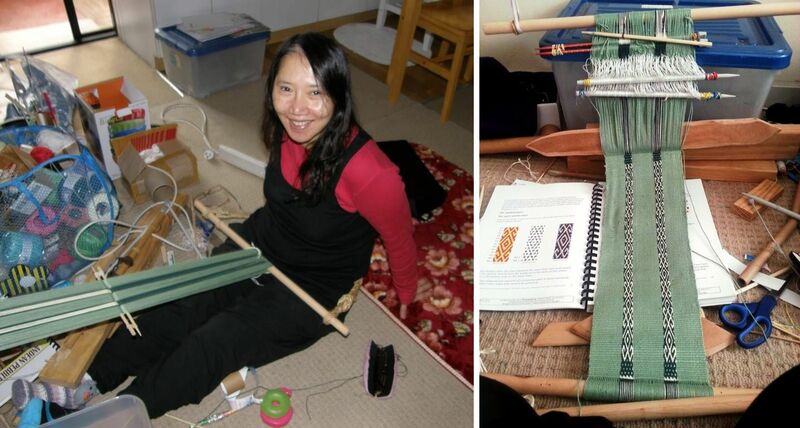 One of the members wove with me on one of my trips and it is nice that they can now study some pick-up weaving techniques together and support each other. Keith posted this picture of some of the first bands with some thoughts of what could be improved. He won me over right from the start with his color choice! So, here I am back at home. I unpack and put away the yarn and other goodies that I have brought back on this trip. As is my policy when new things come in, old things have to go out…out went the rocking chair this time which opened up a whole lot of space! Even so, the “stick corner” in my bedroom gets increasingly crowded. 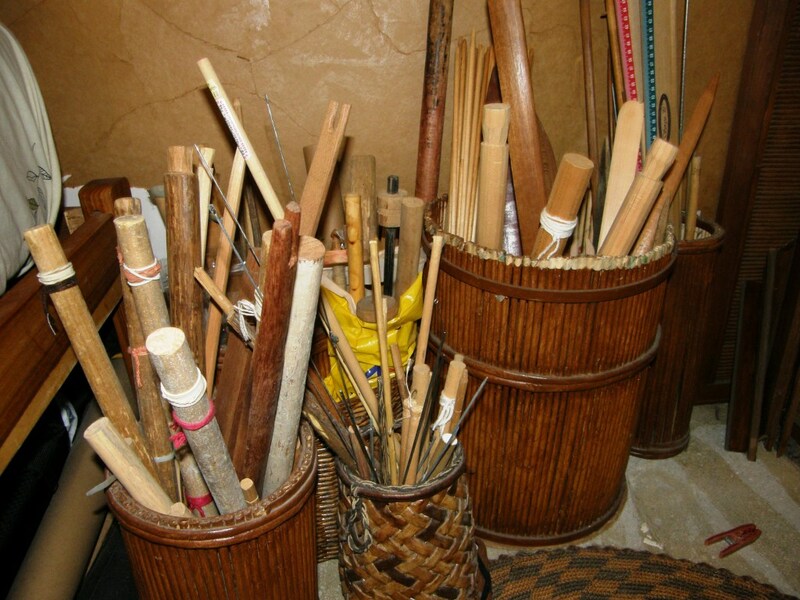 I brought back a whole bunch of dowels that were being discarded and a couple of shuttles. 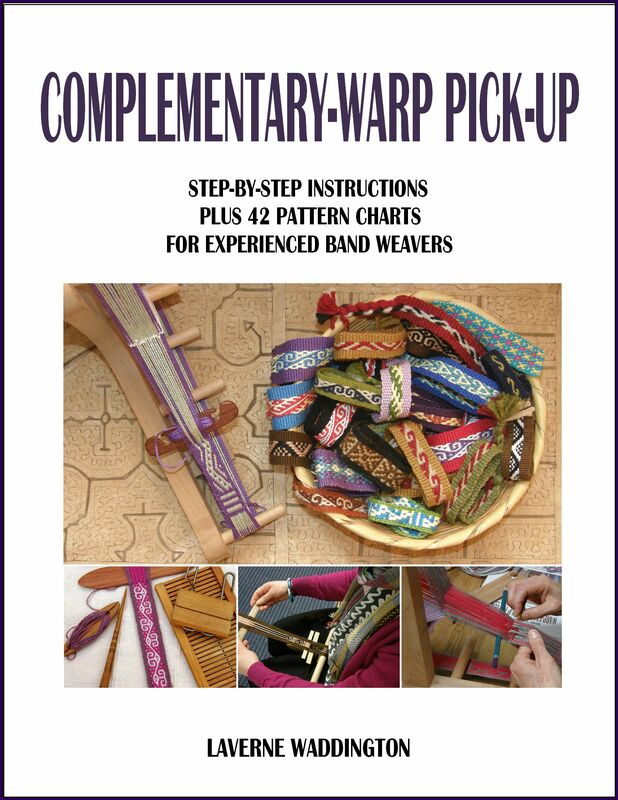 I need sticks of all kinds of lengths for all kinds of warp widths…cross sticks, heddle rods and coil rods…shuttles and swords. 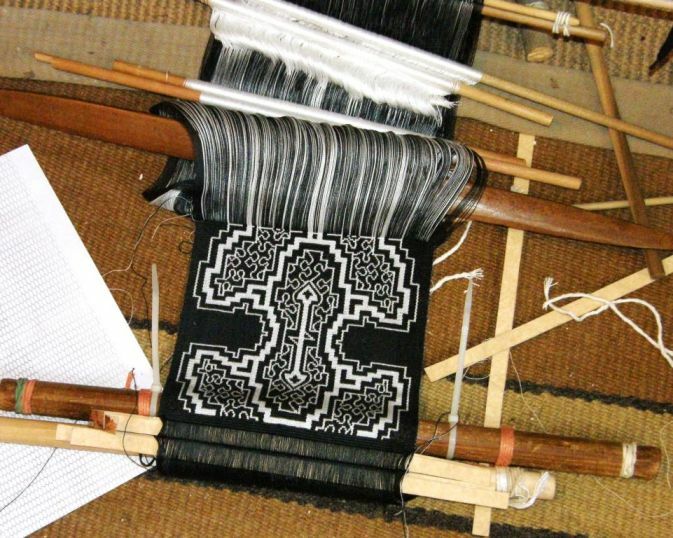 I don’t weave a limited variety of traditional items as many backstrap weavers do and so, I need sticks that are suitable for a vast range of woven widths. It’s a lot of stuff and I wouldn’t part with any of it! Would you believe that there are still times when I can’t find just the right length of stick with the right girth?! But, the equipment you use can be as complex or simple, as rustic or sophisticated as you want it to be. And it’s always nice to know how to improvise a set-up when there simply isn’t any “equipment” to be found..
….in which case a pencil will do for a front beam and a piece of string for a backstrap. The elastic bands will stop the string from sliding off the pencil. For narrow bands, no equipment is required if you have a good set of “magic fingers and toes”! Maxima tensions the warp between her index finger and big toe. 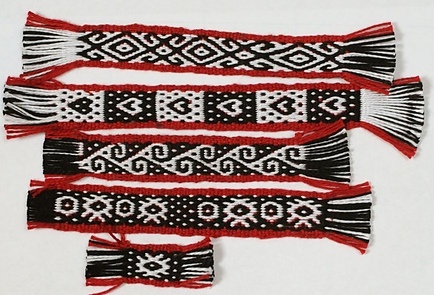 Her fingers are used as cross sticks to form the picking cross and fast flying fingers and thumbs select the colored threads to form her patterns. Her hand is her sword and beater. 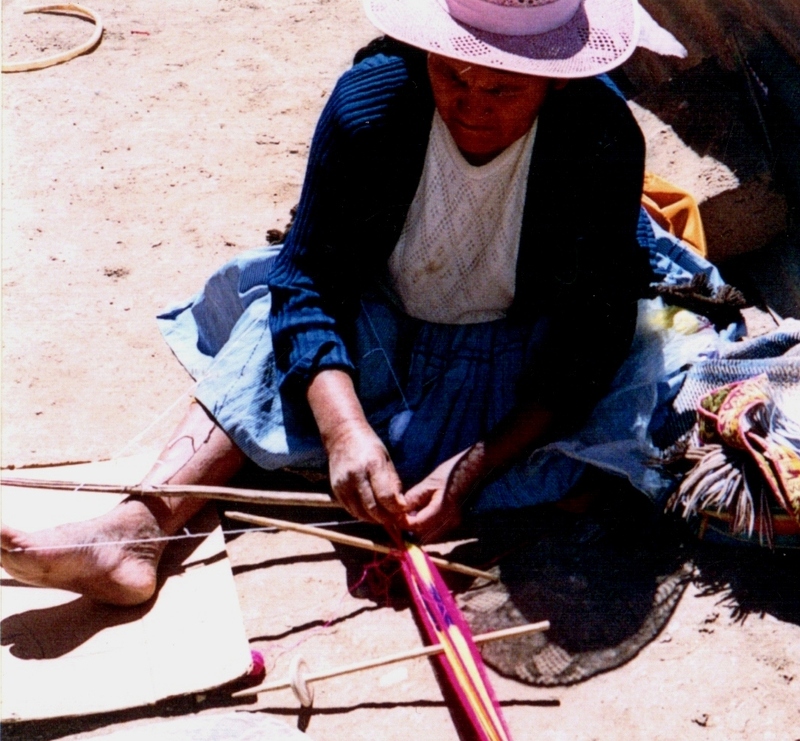 When sticks specifically for backstrap weaving are simply not to be found, as is often the case in the very highest parts of the Bolivian highlands, all kinds of other things can be called into play…like the spindles that Hilda is using in place of cross sticks while setting up a warp for double weave. 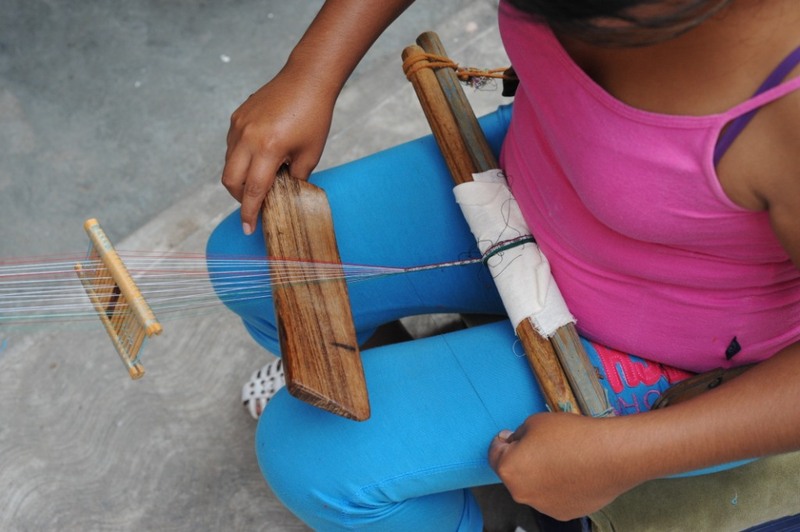 Hilda’s large sticks and rods are saved for her horizontal ground loom. If I am home and have access to my collection of sticks in their handy bins at the end of my bed, I like to use them. I feel more comfortable with a wide breast beam and a backstrap…a nice wide cushy backstrap….no matter how narrow the warp. This Mexican weaver from Santo Tomas Jalieza, Oaxaca seems to feel the same way! Picture from Teyacapan’s Flickr page. So, I will never able to resist grabbing a good stick that comes within reach while I am traveling and bringing it home with me. While there are still things that can be removed from my little home to make space, there will always be room for more sticks! Yep, that was THE best thing about being held back in Sydney…I got to hang out with Ryan some more. If you didn’t get over to Facebook last week to “like’ his page, please help him out by going over now. More “likes” mean more sponsorship appeal, I am sure. I was happy to see so many familiar names there as well as some names I didn’t recognize…people who read my blog but with whom I have not yet connected…many thanks to all of you. I am pleased to hear you are now home after a very long trip from Sydney – thanks for the interesting blog, always enjoy it. I have set up the pebble weave on the table loom with some interesting results with a mixture of yarns – found it hard to get it completely warp faced as I want to kept using the reed too – will keep you posted on the results. Also found some lovely 3ply silk at the Guild Open Day which I think would make lovely pebble weave, however, I think I need a bit more practice before I move down to a finer yarn size of silk. It’s great that you have set this up on your table loom. I am sure the other ladies will like to try that too. Keep me posted on your progress and I would love to see what you do with the silk. Too bad I missed the Open Day.Maybe next time! Am happy you made it home. Looking forward to seeing you again. A third book! Such weaving patience you have. I love the colors of the silk and especially the bamboo reed. I have a Japanese one that is much longer, but I’d love one this size. Do you know of a way I could find one to purchase? I am on a boattrip through France but I brought some weaving with me. Homework from my lessons and I made a simple band and concentrated on the technique of staying on the same width. I can read your blog when we have Wi-Fi and I enjoy it as Always! Thank you for sharing your adventures with us!!! 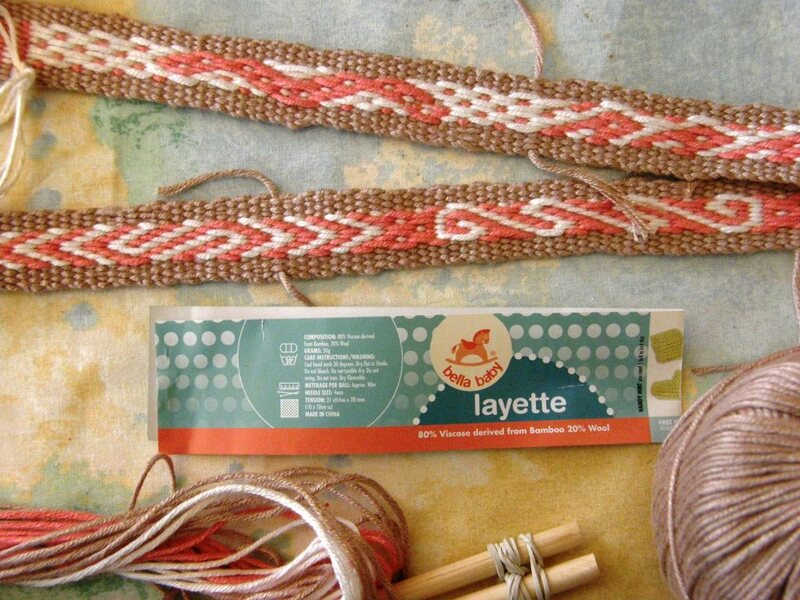 Backstrap weaving on a boat in France…sounds like heaven! Glad to hear you managed to get home at last! I love those silk colours you have there, and I’m looking forward to see what those turn out to be! Thank you Jessica. The silk is on the long list of things to go on the loom! Thank you, Kim! Big hug! 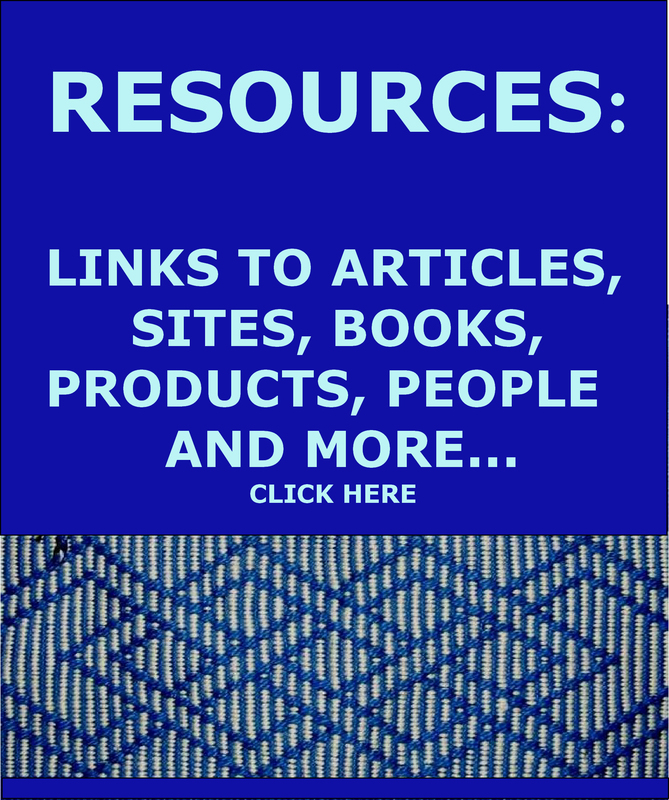 I am a french fan of your blog! 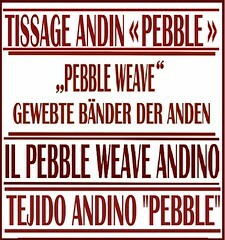 Thanks to it I began weaving, and I love it! 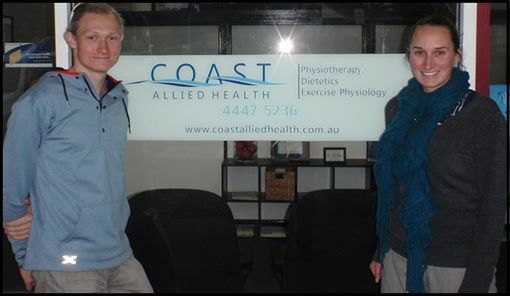 Thanks again for your very great blog! !